3M(TM) Aluminum Foil Tape 3381, annealed aluminum foil, acrylic pressure sensitive adhesive. The foil also serves as an excellent barrier against moisture, dust, flame, and certain chemicals. Acrylic adhesive supplies superior temperature, U.V. and solvent resistance. Applies to both fibrous and sheet metal ducts and conforms to irregular surface. US Coast Guard approve for interior finishes. Conforms to British Standard BS 476: Part 7: Class 1: Part 6, Class 0. 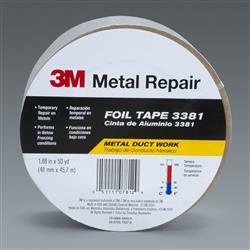 Jaco Aerospace and Industrial is your one stop resource for 3M(TM) Aluminum Foil Tape 3381, annealed aluminum foil, acrylic pressure sensitive adhesive. The foil also serves as an excellent barrier against moisture, dust, flame, and certain chemicals. Acrylic adhesive supplies superior temperature, U.V. and solvent resistance. and all of your 3M Products, Tapes, aerospace and industrial needs.